Why choose just one restaurant? That’s the beauty of food halls: You can mix and match or eat alongside someone even though you got your meal from an entirely different eatery. San Diego’s vibrant food halls add a communal vibe to an already vibrant food scene. It can be tough to choose among the many restaurants at Liberty Station. But those who do not want to commit to just one eatery will love the smorgasbord offered in the public market. Dozens of eateries have permanent stalls or small restaurants there, so everyone can get their heart’s desire but eat together in the group seating area. While you’re getting food from places like Raki Raki Ramen, Wicked Maine Lobster, or Stuffed!, make sure to grab odds and ends from artisan food shops like Venissimo Cheese. find six food stations boasting local ingredients, plus a mobile outdoor area for pop-up cooking demonstrations, and of course beer and craft cocktails (this is San Diego after all). After dinner, stroll the open-air Piazza della Famiglia next door. Where: 890 Palomar Airport Rd. 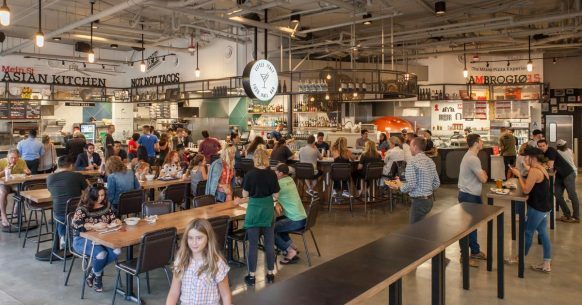 Carlsbad is soon to join the food hall party with its forthcoming Windmill Food Hall. The indoor-outdoor space will host local names like Notorious Burgers, Lobster West, Taco Lady, Thai Style Kitchen, Bing Haus and new creations like DIY rolled sushi burritos at stand to be called Rolled Up, plus made-to-order pizza at Doughballs Pizza.